Loved our visit to Waikoloa Beach Villas. Well-appointed condo, great location (and walking distance to bars / restaurants) and loved having the extra space. We had a wonderful week and would certainly come again! I called guest services on check out as I hadn't had time to check the departure email. Guest services were friendly and helpful. This is our 4th time to the Big Island, by far our best accommodations and location for our interest. The staff was extremely helping with our check in. We absolutely loved this property M-23 and plan to stay there again on our next trip to Hawaii. I strongly recommend this facility and unit. 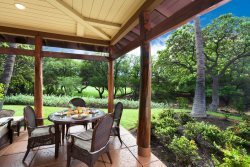 The grounds are beautiful, apartment was modern, comfortable and convenient with beautiful views from the lanai. You will not regret a stay here. This is a great location, near A-Bay beach, shopping and golf courses. All of the staff were friendly and helpful.